The 6 kWh electricity to refine gasoline would drive an electric car the same distance as a gasser? Many ask this question: Why can&apos;t we just put solar panels on an electric car? We could, but the result isn&apos;t very efficient, as we discussed when talking about why an electric car can&apos;t power itself. Basically the issue is aerodynamics, weight, cost, and the smallness of the benefit. Another related question is, how many solar panels does it take to power an electric car? Can we build a trailer to haul those panels around? The desire is admirable - to have the clean electricity directly powering the clean vehicle, and to have a completely self-contained power system for the electric car. Before we get into why it&apos;s not entirely feasible, I do want to discuss the Solar Taxi. This car was driven by Louis Palmer around the world a few years ago. It&apos;s a three wheel electric "car" and is hauling a trailer containing solar panels built by the SolarTaxi sponsor, Q-Cells. The on-vehicle solar array was enough to generate power to drive 100 kilometers, or about 60 miles. That&apos;s not very far especially when the goal is to travel around the world. There were many days Louis Palmer wanted to drive more than 100 kilometers, and would therefore charge the car from a power outlet or possibly run a generator. There were additional solar panels installed at the Q-Cells headquarters in Switzerland to offset electricity used for recharging the car at power outlets. Hence, the Solar Taxi was not 100% directly powered from the solar panels it carried around. The additional power required was offset at a fixed facility elsewhere. This demonstrates the infeasibility of carrying enough solar panels to directly power an electric car. Even for a purpose-built lightweight electric car it was not possible to carry enough solar panels to do so. Most of the cars running in the Solar Car races, like the World Solar Challenge across Australia, are completely impractical for anything but the solar car race. They&apos;re specially built solely for the solar car race and can do no other task. Stella is different. 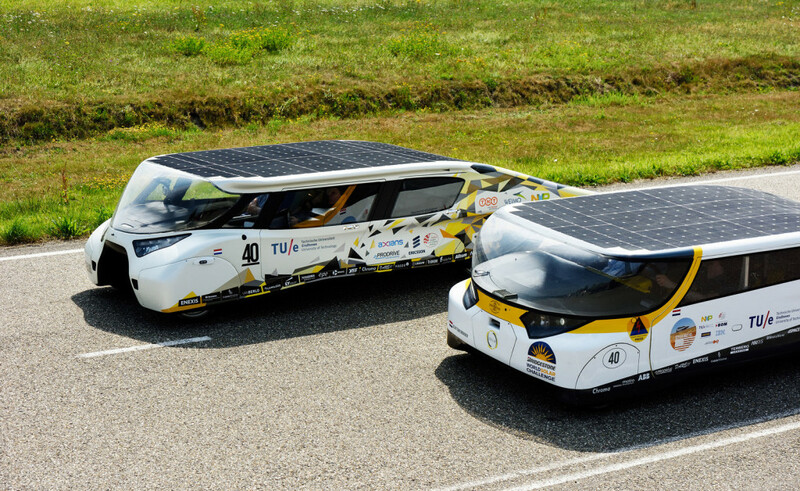 It was built by a student team at Technische Universiteit Eindhoven for the World Solar Challenge race in Australia. Rather than make it a special purpose car useful for no other task, this design is supposedly functional as a four person family car. And yes it can carry four people and some cargo. Stella was so good in the 2013 race, that they won in their category. The 2015 version of Stella can generate enough power for 300ish kilometers of driving on solar power. We&apos;re talking about a different level of performance than the Solar Taxi. 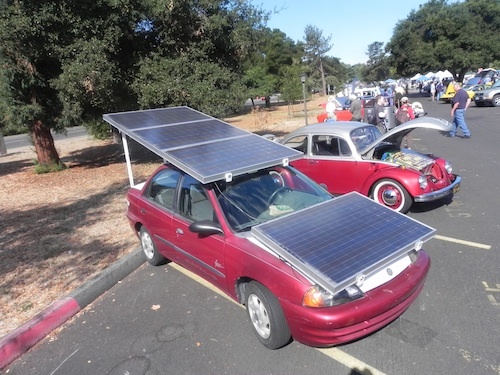 Enough talk - How many solar panels does it take to power an electric car? The key limit to power one can generate on-board the vehicle is a rule of thumb -- each square meter can theoretically generate at most 1 kiloWatt of electricity. In practice there are a number of factors limiting how much is generated by a given solar panel, in a given location, in given weather conditions, etc. Is it a panel whose efficiency drops when it gets hot, and is the weather hot? Is the panel orientated optimally to the sun? Is the panel shaded in any way? Are the weather conditions decreasing the amount of available sunlight? Obviously a car driving down the road cannot arrange the panels to be optimally oriented to the sun, cannot prevent shading, etc. A solar car driving on a highway is at a huge disadvantage for generating electricity. Therefore, of the 1 kiloWatt per square meter theoretical maximum, solar panels on a solar car would generate a small fraction of that power. Even if we took the 1 kW per square meter number as fact, there&apos;s a significant limit. Typically an electric car driving down the highway will be consuming 50 kiloWatts, 100 kiloWatts, or more. The Insane or Ludicrous modes of the top end Tesla Model S - 3 seconds 0-60 miles/hr, etc - would require a lot more power than that. At 1 kW/sq meter, 50 kiloWatts requires 50 square meters of solar panel surface, in optimum orientation to the sun, etc. That&apos;s just not practical. But I&apos;ve just misled you a little bit. A solar electric car will carry a battery pack, and it&apos;s the battery pack which will supply the 50+ kiloWatts required for highway speed. The solar array doesn&apos;t have to provide that much power by itself. Instead the battery pack would have capacity for, say, 100 miles of driving and enough solar panels to recharge the pack in a reasonable amount of time. If that&apos;s a 30 kiloWatt-hour battery pack let&apos;s estimate how big a solar array is required for a reasonably fast recharge. A bit of searching online turned up a kit for a 7.5 kiloWatt array that required 30 panels, each rated for 255 Watts, and weighing about 40 lbs per panel. A 1200 pound array means a 4 hour recharge time which is not bad, but the array is completely impractical to haul around full time. If you get 5-6 hours per day of usable sunlight, the smaller array that&apos;s easier to carry on-board requires multiple days to recharge the car. It&apos;s much more practical to keep the solar panel array at a fixed location. On another page we discussed how most houses have enough roof-space to hold a solar array large enough to power not only the house but 1 or 2 electric cars. As Louis Palmer (Solar Taxi) did with his vehicle, your solar array at home can offset all the electricity consumed by your car even if you charge at a public charging station somewhere. Those public charging stations could have solar canopies to offset electricity its consumption.